Show off that pretty linen with our USA made napkin rings. Every napkin ring we make is handcast for strength, so you can ue them every day. 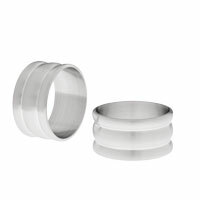 Whether you buy a pair, or one for every member of the family, these napkin rings are going to look great on your table. 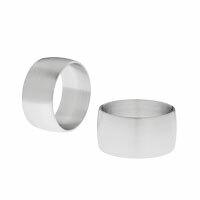 Napkin rings make ideal gifts for weddings and engagements. So remember that important couple or special bride. Put on their names, monograms, wedding date, last initial, the possabilities are endless. 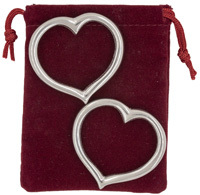 Napkin rings for lovers come packaged as a pair in their own plush pouch. Each napkin ring is handcast in the shape of a heart. Pssssst - gentlemen this is a great Valentine's gift, show her how romantic you are.